I wrote before on the Sacred Space Paradox. The paradox is that as we set aside certain spaces like nature preserves and designate them ‘sacred’, by default we say that the rest of the world isn’t sacred in the same way. As a result, instead of treating the entire world as a nature preserve, we relegate certain areas to ‘museum-esque’ status – meant to be interacted with in very controlled manners. The corollary to the Sacred Space Paradox, is the Sacred Time Paradox. We designate certain times as sacred and hence we behave in a certain manner in those times, but as a result, we de facto act in different ways during those ‘profane’ (not sacred) times. That special day in the year when we give thanks for all we have. We give thanks for the bounty of harvest, for friends and family (and I am especially thankful for you, the reader!) It is a time for togetherness and sharing. So why do we make a point to be thankful but once a year? Is there anything that we do on Thanksgiving that we shouldn’t be doing every day? Don’t get me wrong, it’s a good thing to have a communal holiday that highlights giving thanks (at least in the ideal.) But it’s important to be cognizant of the Sacred Time Paradox so that we can create a better world. Irrespective of the religious tone, each one of the lines is a great reminder of what it means to be truly thankful for something. It’s not just about remembering, but about service and designing and innovating for others, to make their lives better. That’s why I’m also including my “Thankfulness Process“. 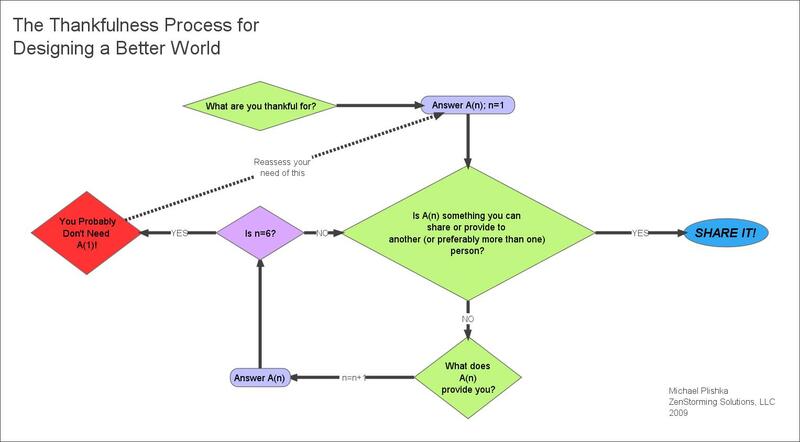 I developed this flow chart to help us better understand what we’re thankful for and help us ponder ways in which we can transform that thankfulness into action. Let’s make a point to not fall too deeply into the Sacred Time Paradox. Let’s reflect on what we’re thankful for more often, and more importantly, let’s use that thankfulness as an impetus to be more, and do more good, in this world. Today, and every day, try and spend a few moments being thankful. Not only can it help you be healthier, my wish for you is that it empowers you to create a better world for those less fortunate. This entry was posted on December 1, 2013 at 3:16 am	and is filed under culture of innovation, Design, innovation, Philosophy, Social Innovation, The Future. Tagged: Design, future, helping others, innovation, Religion, service, serving others, social design, social innovation, social responsibility, thanksgiving, The Human Person. You can follow any responses to this entry through the RSS 2.0 feed. You can leave a response, or trackback from your own site.